It is amazing how the little things in life can bring such joy. 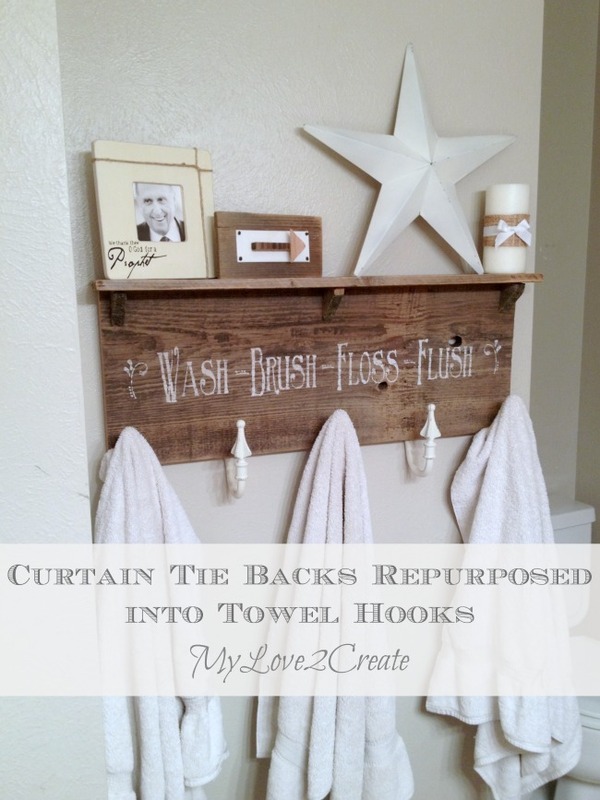 For example, these curtain tie backs repurposed into towel hooks are making me very happy! It was a few months ago when I first shared them on My Repurposed Life, and I LOVE them! Why, you ask? Because my kids can actually hang up their towels...instead of throwing them on the floor, and that is something to be very excited about! Trust me. So, I went shopping in my stash of random cool objects I buy for $2 at the Restore...and these curtain tie backs are what I found. I have had them for over a year at least, they have been patiently waiting for me. And yes, it was $2 for all 5 tie backs, Sa-weet! Since I love reclaimed wood I grabbed one of these really wide fence boards I got last year at our city spring clean up. I started to see how these curtain tie backs would work for hooks and I was impressed at how perfect they were! I decided to cut off the end and use the jagged edge pieces to make shelf supports. 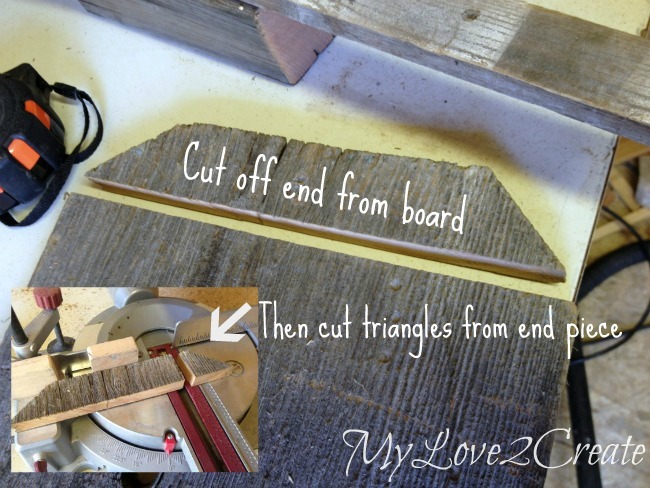 I used the two triangle end pieces and cut one from the middle. 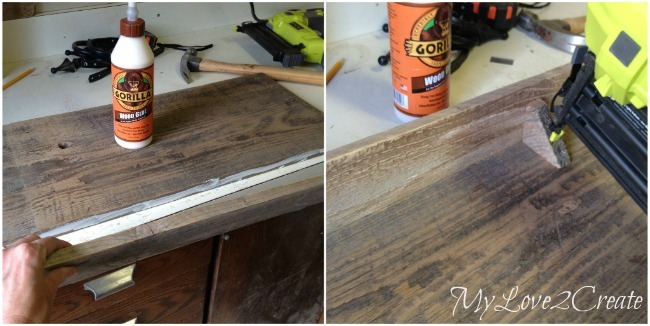 Using another smaller reclaimed fence piece I glued and nailed it on the top of my wide board (top left). Then I glued and nailed on my end triangle pieces for the shelf supports. 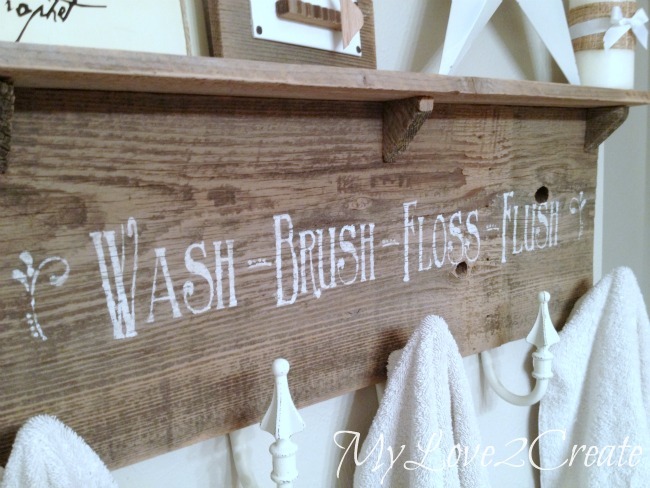 I wanted something fun and bathroom related on the shelf board...it is always hard for me to decide this type of stuff. 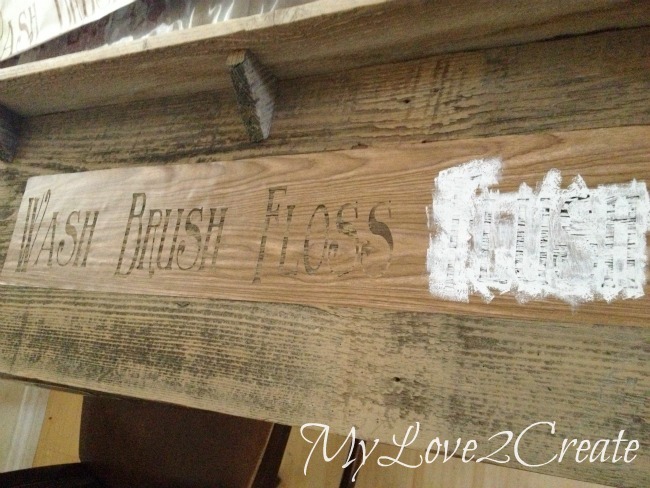 So I finally just went with a well used: wash, brush, floss, flush. Good words to live by in a bathroom, maybe the words will actually sink into my kids brains if they see them several times a day? I cut them out of contact paper on my Cricut and stenciled them on in white. Using a Martha Stewart Stencil I added a little flourish on each end. I used the very end of the same design to separate the words as well. 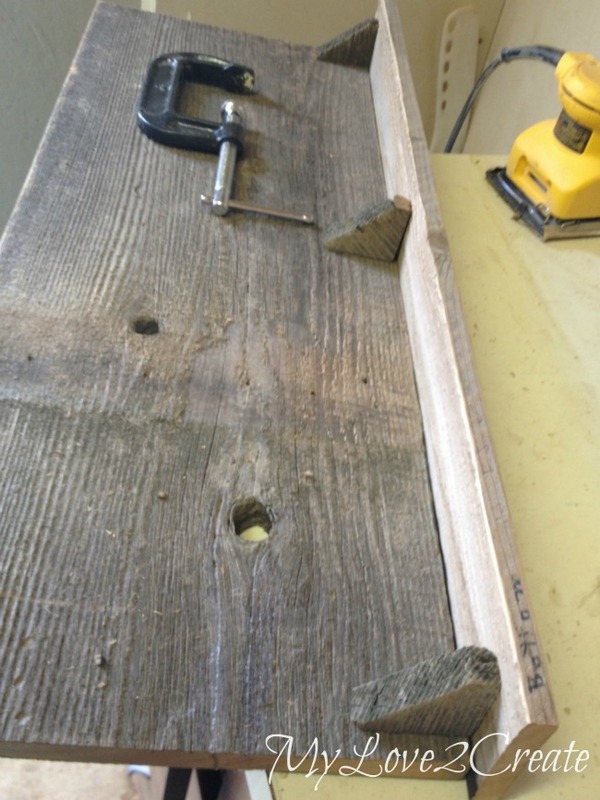 I attached the hooks, or curtain tie backs, on the back of the board with screws. I made sure to pre drill first so the wood would not split. I also added eye hooks and picture hanging wire on the back top of the board. I prefer D-rings but I only had one, and didn't want to go to the store. And that was it! 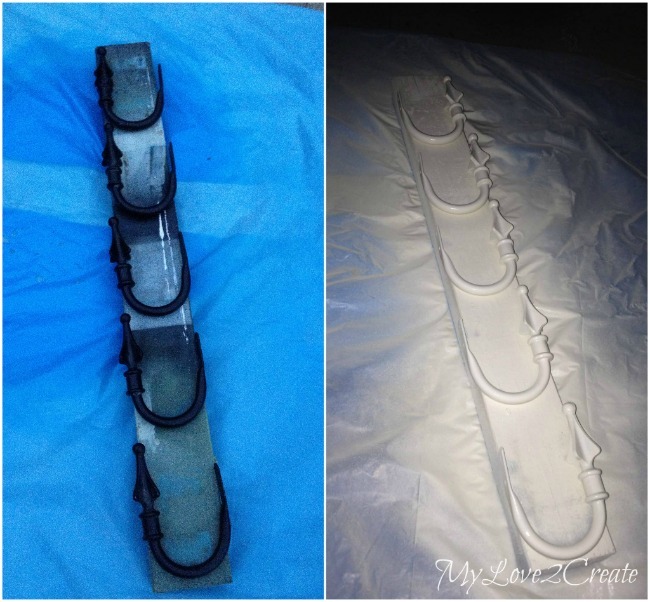 I took a scrap of 400 grit sand paper (because it was what I found real quick) and sanded the stencil and the "new hooks" for a light distressing. Now isn't this much better!? Not only is it functional, but cute too! Just. how. I like it. The perfect size for my kids, and super easy for them to take off and PUT ON the towels. Yippee! So what do you think? 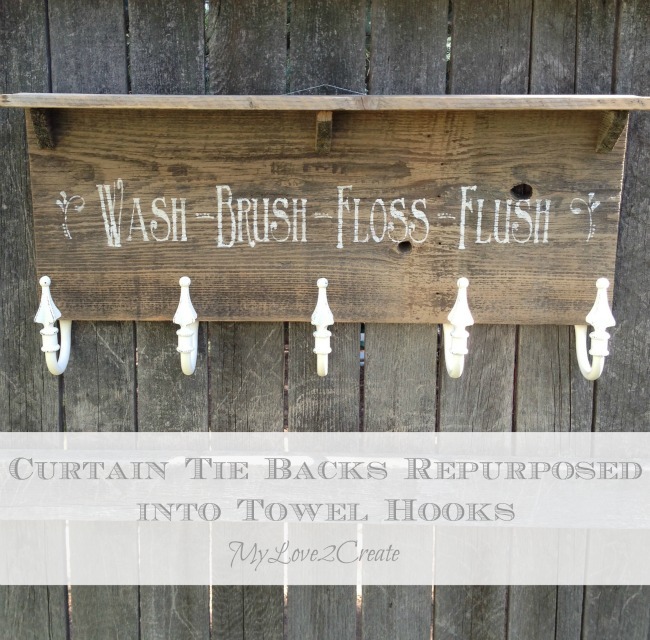 Want to run out and repurpose some old curtain tie backs? 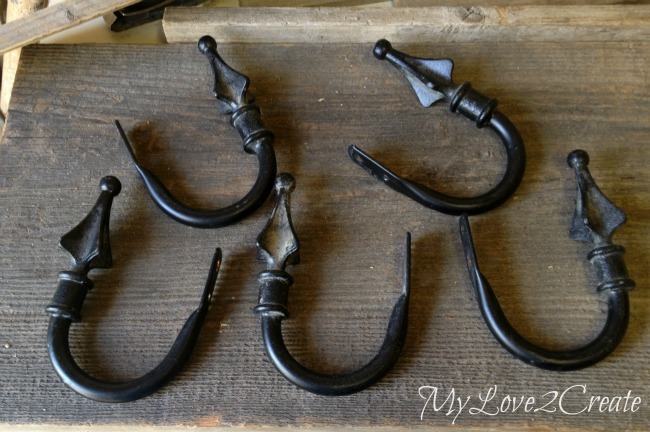 I see them all the time at thrift stores, and in my opinion you can never, EVER have enough hooks! 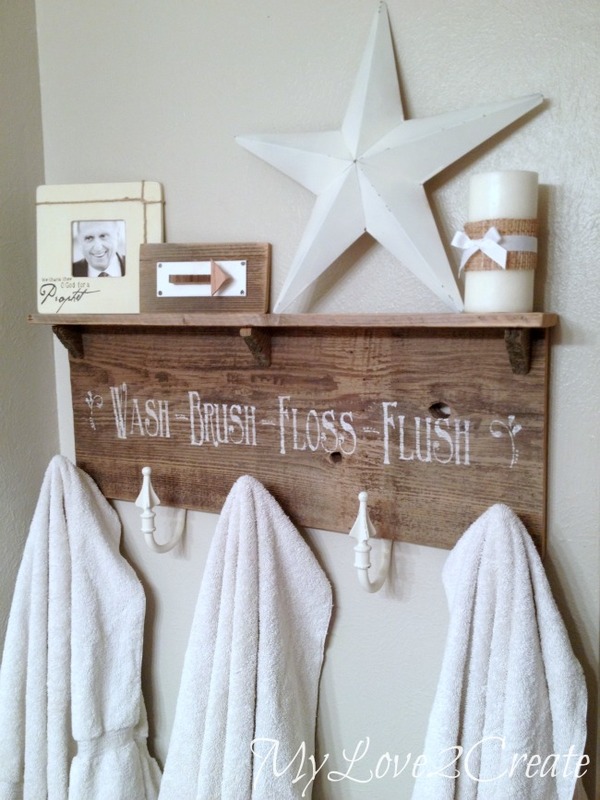 If you want to see how I am hanging my hand towels in this same bathroom you have to check out my Rustic DIY Shelf. Super cute! I love it! Why not use curtain tie backs? And they have a lot of character! Oh, this is soooooo clever and oh so cute! Great job. I love how nautical it looks! Love what you have done. Thanks for sharing. Great use of unexpected items. 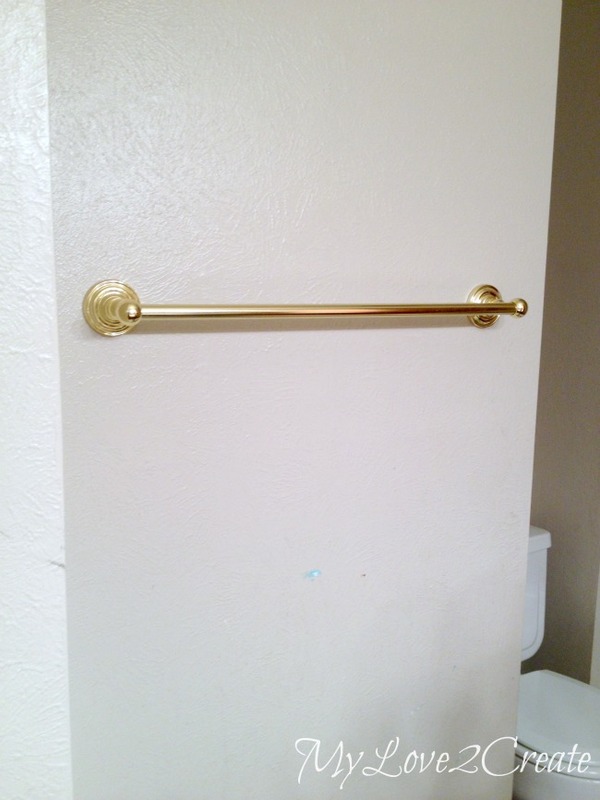 I can so relate with an empty towel rack, drives me insane. What a steal $2 for the hooks!!! I keep meaning to go to the re-store. Contact paper in the cricut!! !- Genius. I have been using vinyl to make stencils, and vinyl ain't cheap. Thanks for that tip. Looks great! Hope your kiddos use your hooks now. This is beautiful! 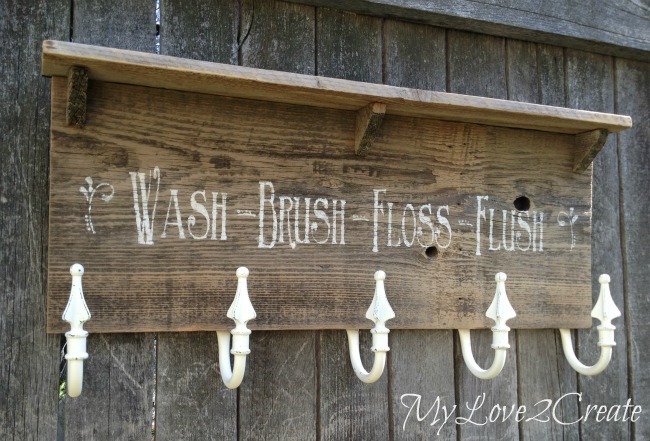 Love the rustic look and how you re-purposed those tie backs. It turned out just beautiful. I love it in every way! The best form of flattery is imitation. You may see me do just that in the not too distant future because I love this! Stopping by from Merry Monday. So Creative. I love it ! Wow what a difference! That space is so cute now! I love that you were able to use reclaimed wood, and what a great picture of our dear prophet! Thanks for linking up to Merry Monday, hope you will join us again this week! This is adorable! 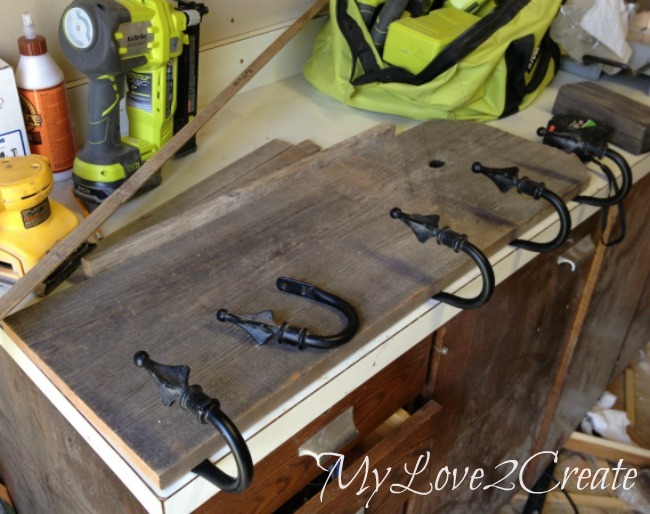 Wow, great idea to use curtain tie-backs! Love the results! Thank you for linking up at Motivational Monday! So cute! I love it when things are used as hooks that are not actually hooks! I live this!!! This is too cute and I am LDS too and love the pic of the President Monson! So cute. Do you have a tutorial? where did u get it? would love if link this on my party today. Featuring this at Trash 2 Treasure Tuesday this week. Your photos are so awesome I seriously can never decide which one to choose when I feature you. 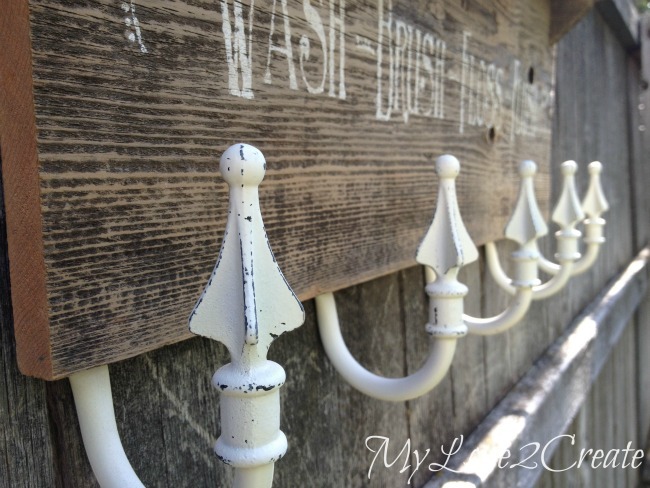 :) Beautiful towel rack - wish you could make me one. Ha. I love it. So creative! 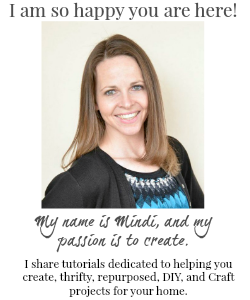 Mindi this is so darn cute I can't stand it! You are so creative. 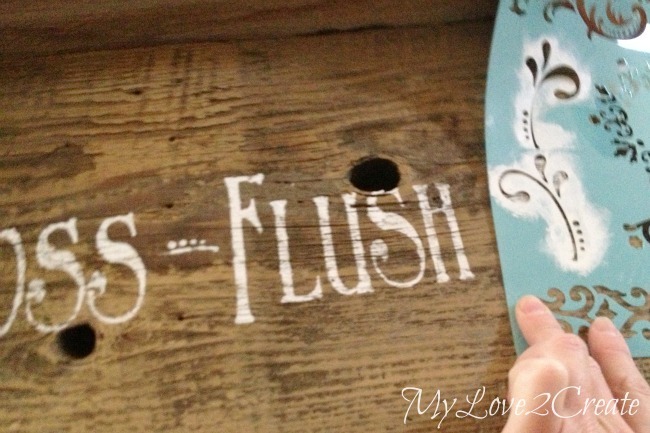 My daughter would love something like this in her bathroom! You are speaking my love language! I love this! I'm sharing this like crazy! 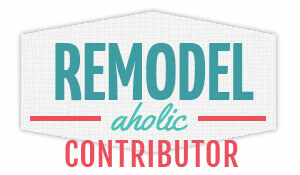 I would love it if you linked it to my brand new link party http://www.carissamiss.com/2014/09/outside-box-link-party-no-1.html. 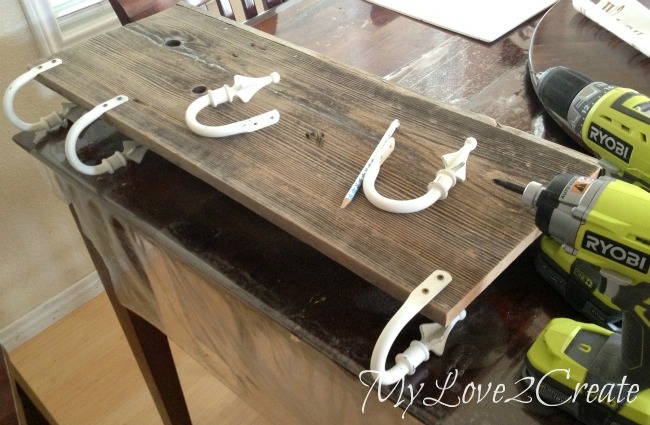 Oh my goodness I need these hooks for my boys' bathroom! There are always towels everywhere! Great tutorial and thanks for sharing on SHOWLicious! I need this in every bathroom. Been trying to come up with something. This turned out so cute!!! Good job! This is super cute, what a great idea!